Some time ago, our esteemed founder had an unfortunate experience at The Oinkster in Los Angeles. His pulled pork sandwich did not include Carolina BBQ sauce and he was left wanting. This is understandable. If you order one thing expecting another, you will usually be let down. As park of Pulled Porkstravaganza, I am here to offer my own humble take on The Oinkster’s product. I’m something of a regular to The Oinkster. I have reviewed one of their sandwiches before and I often find myself heading there rather than Dave’s, although the two establishments are in extremely close proximity. What I have gleaned from my many visits to the Oinkster is that they often forget to include containers of Carolina sauce with the pulled pork sandwich, particularly when the order is placed for carryout. On the surface, this seems like a gross oversight. The sauce is for the sandwich. Wouldn’t it stand to reason that this is something that should be tossed in the bag without a second thought? In truth, I probably ordered and consumed half a dozen of their pulled pork sandwiches before I ever beheld a ramekin of the rumored sauce. It didn’t actually matter to me. I find the sandwich extremely satisfying on its own merits. The pork is savory, juicy, and chock-full of delicious bark. The included onion and cabbage, which seems on the surface nothing more than something to stave off boredom, actually adds immense flavor and makes the sandwich whole. My suspicion is that these two simple ingredients trick the employees of The Oinkster into thinking that the sandwich is complete after being assembled. And you know what? They’re right. As I said, I had eaten a good many of these sandwiches before the sauce presented itself to me. Up until that point, it was my “go-to” pulled pork sandwich. An extremely filling meal with a very pleasing flavor. I admit to having an affinity for the fries at The Oinkster, but every time I ordered the sandwich, I looked forward to it immensely. But then…the sauce. The sauce is always served on the side, never on the sandwich, and I imagine there are many customers, like our esteemed founder, who arrive home, find no sauce in the bag, and sullenly chew their drier-than-they-were-expecting sandwich. I can further imagine there are customers who dine in, receive no sauce on the sandwich, are not given sauce on the side, and assume there is no sauce to be had. Some of these people are bound to be let down, or else are unfamiliar with the tropes of the pulled pork sandwich, or assume this is a new “spin” on an old classic. The sauce is, in a word, perfect. Not too tangy, not too sweet. It was made just for this sandwich, and this sandwich for it. Similar to the sandwiches at Philippe’s, one may, if one wishes, apply sauce to each bite, or take one side of the bread away and pour the sauce on the whole enterprise, or hold your wrapped half of the sandwich upright and allow the sauce to work its way down into the sandwich of its own accord. It’s up to the individual. I feel this is what truly sets this sandwich apart from most other pulled pork endeavors I have encountered: the sandwich is good with any amount of sauce, or without any at all. Depending on the amount of sauce you apply, you can have a different experience every time. This is fantastic. From the first time I encountered the sauce, this was transformed from my “go-to” to my favorite pulled pork sandwich. Try it both ways. Then try it a few more. You won’t be sorry. 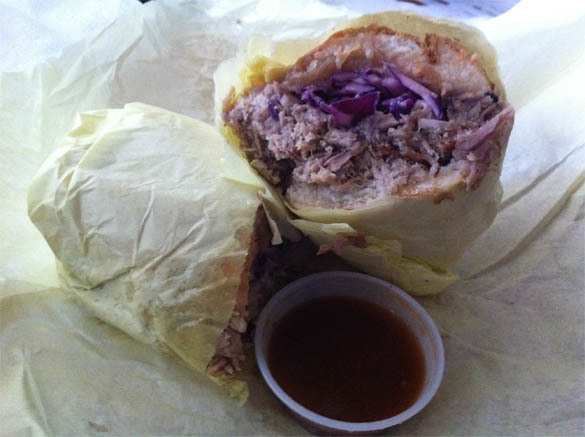 This entry was posted in General Sandwich Discussion, Sandwich Reviews and tagged Los Angeles, Pork, Pulled Porkstravaganza, Reviews by Bill, Sandwiches I Have Eaten, The Oinkster by bengrimm. Bookmark the permalink.